Among all of the different technology options, channels, tactics and strategies, a key tool for any company seems to fade into the background noise: a Lead Management Framework. Most companies will tell me that they have defined funnel stages — and they often do have stages defined in a PowerPoint deck or some other document. But that is a long way from having a true Lead Management Framework that is defined and operational across both Sales and Marketing. And without all the pieces in place, they are leaving leads and revenue on the table. Quite simply, a Lead Management Framework is the backbone that supports all marketing and sales processes, procedures, and technologies. Every modern marketer knows that the demand funnel is aptly named; you start out with a large reach and a large quantity of leads, then fewer and fewer qualify as they go through the stages until finally only a few end up as customers. A complete Lead Management Framework defines more than just funnel stages. It defines responsibilities of each role in the organization at each stage of the funnel. It defines the movement of leads through the organization from marketing to sales (and back again if necessary) and sets up the processes and procedures for keeping track of them. And, almost as importantly, it defines lead stages that exist outside the funnel, such as Recycle and Disqualified. I often see surprising success in addressing Recycled leads and nurturing them as a specific lead stage, so that’s one of the first things I recommend that clients implement in a lead nurturing framework. And what do you do with your leads after they become your customers? You continue to enhance the customer experience towards further expansion! 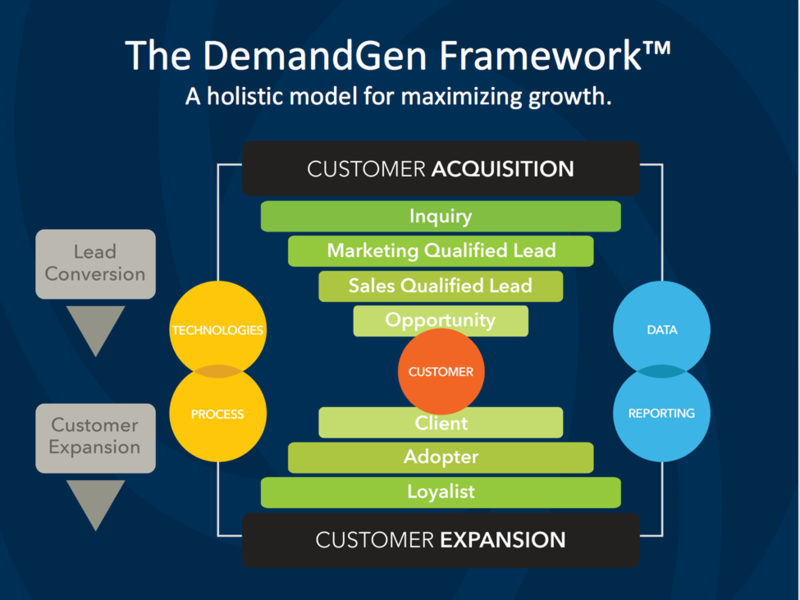 That is why the DemandGen Framework is actually an hourglass, rather than “just a funnel.” The stages in the bottom of the funnel are defined to help grow your customer adoption, loyalty and turn them into advocates for your products and services, driving in more customers. In this way, by moving your customers through the stages at the bottom of the hourglass, they drive expansion through bringing in more and more business and goodwill. Having a defined Lead Management Framework provides the vital agreed-upon definitions, procedures, and processes that ensure everyone in the sales and marketing is speaking the same language, measuring the same performance, and working together as a team on the same field with the same playbook. ABM, Demand Generation, Inbound, Event, Channel, Field Marketing. . .Your Lead Management Framework underlies them all. The Lead Management Framework lays out the path that leads and accounts have to walk to become a customer. As each lead/prospective account accomplishes certain actions, they move to the next stage. And since everyone on the team knows exactly what that means, and the procedures and SLAs on their actions are in place, leads don’t fall through the cracks. All of your tools, technologies, campaigns, and strategies are aligned to moving leads and accounts from stage to stage. Outbound campaigns to acquire new leads establish exact actions leads need to take to enter into the hourglass. Lead nurture frameworks are designed to move and accelerate leads along the stages. Lead scoring evaluates the myriad combinations of lead behavior and qualifications and calculates where the leads are in the framework. As Sales creates opportunities and closes new accounts, funnel stages are updated and new customers can start their journey to becoming advocates. After account-based marketing strategies identify target accounts, the whole range of communication and engagement is there to move the leads in those accounts through the funnel stages. If you can’t identify how a technology, tool, or strategy fits into moving leads and accounts through the hourglass, it is most likely wasted money. And with the proliferation of technology and tools to address all facets of marketing, it is important to spend your budget on the most important ones that drive the most funnel movement. Each year, all of us as marketers have more choices than ever on how to spend our time and money with higher revenue targets and expectations than ever. Make sure that your Lead Management Framework is a strong enough backbone to support all the weight. If you would like to expand more on lead management, you need to check out Manufacturing Demand: The Principles of Successful Lead Management, the number one book on lead management authored by DemandGen founder David Lewis or simply drop us a note! Ryan Johnson develops and implements marketing automation strategies for DemandGen clients, helping them to streamline and optimize their marketing and sales processes to drive success.